Don’t Call Me Unforgiving Because I Seek Justice! Years ago, I had an encounter with a Holocaust survivor that I will never forget. His name was Howard and the two of us worked together in the Men’s Department at what was then called The May Company, located on Wilshire and Fairfax in Los Angeles. Howard was a delightful Jewish man in his 60’s. He spoke with a thick German accent and was as funny as one could be. Having not spent any time to get to know him, I knew nothing about Howard’s background, but I so wanted to witness to him. The year was 1972. I had just become a follower of Christ and I knew very little about Christianity and Christ himself, for that matter. In fact, at the time, I didn’t even believe in Christ’s divinity—Yes, you can be a Christian without believing in the Trinity, but that’s a different story for another time. In the 70’s, Christians were big on “End-Times” issues. Christ’s second-coming was right around the corner, yet we were taught things were going to get a lot worse before his return. All one had to do was look at the signs of the time and get ready for the end of the world. “Howard, you need Christ in your life because He is coming back soon and things are going to get very bad,” I told him very assuredly. Slowly, Howard closed the cash register while rolling up his left shirtsleeve. He turned around, looked me straight in the eyes, and with anger in his voice, he pointed to a number tattooed on his wrist and said, “You mean it’s going to get worse than this?” He then walked away in silence to assist a customer. Today I am glad he walked away from me when he did since I was about to talk to him about forgiveness. Here I was, a foolish young Christian man who knew nothing about who Howard was and what horror and injustice this gentle old man had experienced, yet was ready to “teach” a Holocaust survivor a thing or two about forgiveness. Why is it that so many of us Christians are quick to demand forgiveness from others? For example, right after the Columbine High School shootings, many Christians were literally demanding forgiveness for the animals who brought so much pain and agony upon all those families. The majority of these Christians weren’t remotely involved with the tragedy or even lived in Colorado. Shouldn’t we, at least, give these survivors a bit of time for grieving and venting in anger– a process so necessary for emotional healing–before demanding forgiveness of them? In the late 90s, I personally had a very hard time with the concept of those Western Christians who walked the path of the Medieval Crusades, asking forgiveness of all the Arab nations on behalf of what was done to them in the name of Christianity. Being a Muslim background believer, I constantly had to ask forgiveness of myself, but, unfortunately, my Muslim side, being honor bound, kept refusing to accept my Christian side’s apology. Yes, I’m being sarcastic. After I was fired from my Middle East mission coordinator position, I was deeply hurt and angry and needed to vent. Those who are close to me know that it’s through venting and discussing my frustration that I get the poison of bitterness out of my system. However, there were those who were uneasy about the way I was dealing with my pain. “Brother, you should forgive because the Bible says so!” they would tell me. Here, Jeremiah calls his own people, the very chosen of God, the men and women he would give his life for, a bunch of horny, whorish defiled camels and jackasses because they are following a broken system that is opposed to God’s way. Is there anger, bitterness and resentment in Jeremiah’s voice? Of course there is. I wonder how many of my Christian friends would have accused the YHVH’s prophet of lacking forgiveness. Instead, they are quick to point out that the Jews deserved it. Can you sense the anger Jesus is showing toward the Pharisees? I am sure Jesus was not patting these guys on their backs while insulting them. In my Iranian culture, to say, “woe”— vaay in Farsi — to someone is pretty much the equivalent of saying, “You deserve to go to hell”. And that’s exactly what Jesus is saying to those whom, for generations through their teachings and instructions, had kept the Jewish heritage and laws intact. For all the years I have been a follower of Christ, I have never heard any Christian accusing Jesus of harboring resentment or having an unforgiving attitude toward the Pharisees. In fact, my experience has been totally the opposite. If I had a dollar for every time I heard a pastor preach with glee and an admiration for the way Jesus confronted the religious people of his day, I’d be the one bailing out Fannie Mae and Freddie Mac instead of the government. Yet, when I or other believers dare to question some of the Christian leaders of our time, we are accused of not showing Christ-like forgiveness. Do you ever stop to think that by doing so, we, like Jesus, are seeking justice and truth and our attitudes toward these men have nothing to do with a lack of forgiveness on our side? Is it possible that after 25 years of being a pastor and six years of working within a Christian corporation, I have seen way too much crap to keep my mouth shut? It amazes me how these same Christians demand accountability from any government official — especially if that individual is not a Republican — yet when it comes to keeping their own Christian leaders to the same standards, they refuse to do so less they be accused of lacking forgiveness. I feel regret for all the years I saw injustice and hypocrisy within the Church and didn’t say anything. I didn’t do it because I was afraid or was trying to whitewash the actions of certain individuals. I simply believed that it was I who was wrong. After all, I am but a converted Iranian pastor from a Muslim background. “Who am I to question the sincerity of my American mentors?” were my thoughts for years. But today I realize how wrong I was. There is a time and place when we have to demand accountability at the cost of being accused of harboring resentment or unforgiveness in our hearts. The other day I was talking to a friend who is a white American male—Bear with me. I know mentioning someone’s race is not very PC these days, but there is a point to this race calling. He was basically telling me that the people who don’t vote for Obama are racist and if he loses it is because he is black. “Of course not, you are different,” was the response. “How am I different?” I asked. “Well, you are Persian,” was the answer. “So, you think because I am not white, I can’t be racist?” I asked with a funny look on my face. “No, that’s not what I meant. It’s this country that is so racist,” answered my friend looking rather serious. “What do mean, ‘It’s this country that is so racist?” Now, it was me who was serious. This was not the first time I had had a conversation like this with Americans who honestly believe that we live in the most racist nation in the world and somehow only white people are perpetrating this act of racism. What I find interesting is, here I am, a naturalized American citizen from the Middle East, having to defend America against American-born Christians and non-Christians alike. Have you noticed how the Chinese, the Koreans, the Persians, the Arabs, the Blacks and the Hispanics can all have their own churches which are called the Korean, the Persian or the Black church of such and such without anyone ever walking out of those churches saying, “My goodness, that church is all Hispanic or all Arab!” or, accusing those churches of being ethnocentric? Yet, I can’t tell you how often I have heard Christians tell me, “Last Sunday I went to an ALL white church!” as if they were referring to a KKK gathering. I have lived in the United States for almost 40 years. I went through the Iranian hostage taking in the late 70s and the two Gulf Wars when, if the above people were correct, I should have faced some kind of discrimination and yet I can’t prove that at any time in these last 40 years I have experienced any such thing. Even when the pastor of a mega church referred to me as “our token Iranian pastor” in front 900 people, did I take it to be a racist act? No. Stupid and ill advised? Definitely! But, not racist. This is not to say that there are no racist Americans. There are many of them. But, they come in every shape and color – not just white. But that does not make the whole nation racist. A few months back, Karen and I went to Montgomery, Alabama for the commissioning of our son, Todd, into the United States Air Force as a Second Lieutenant. 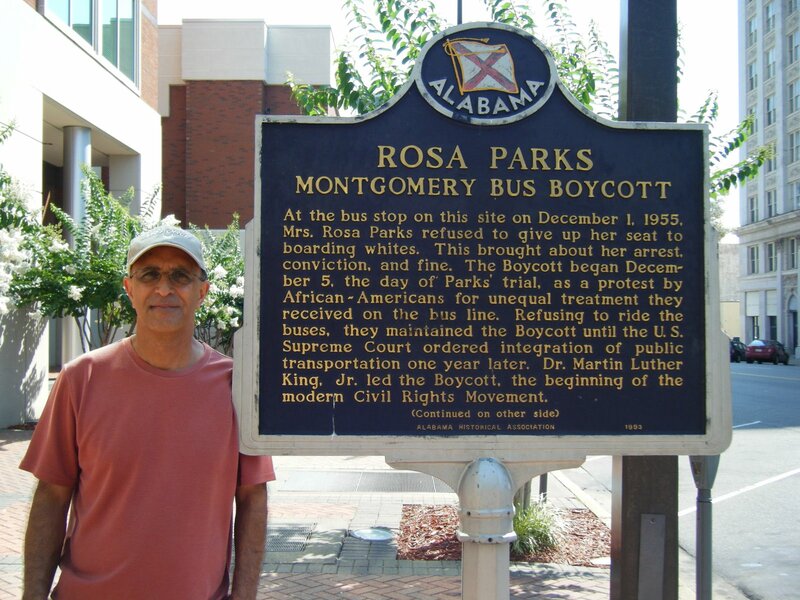 While there, we visited Rosa Parks’ Museum. I can’t tell you the emotion I experienced and how I wished I had lived here at the time so I could participate in the Civil Rights marches and have the honor of walking side by side with Dr. King. Please compare what America has accomplished in her short history with some parts of Africa or the Middle East where people have been killing each other for hundreds of years because people of tribe A consider people from tribe B to be inferior and therefore worthy of being wiped off the face of the earth. Racism is a disease that plagues every race, color and nation and white people do not have a corner on it. “Well, there could be couple of reasons. First, they might be racists and dislike black people. After all, some Muslim countries still use black people as slaves. However, there is a second reason. They are afraid of you,” I responded. “Rosa, how many blacks do you know that have been mugged by Iranians?” I asked. “I have two Iranian friends who were mugged by black guys and my third friend’s father was shot to death by a black man. Do you blame these friends of mine for being afraid of blacks in general? Is it possible that your Muslim neighbors might also have friends and relatives who have experienced the same things?” To her credit, my dear friend, agreed with me. The other night, as I was channel surfing, I came across Chappelle’s Show. Dave Chappelle is a black comedian who, like most ethnic comedians today, gets a lot of laughs by making fun of white people. I guess it is considered comedy when other races make fun of white people. However, when it is done the other way around, it is called racism. To his credit, on some occasions, Chappelle also pokes fun at his own people. On this particular episode, using all black comedians, he did a skit called something like, “If people don’t like you, it could be that you are a jerk and has nothing to do with your race.” Is it possible that some people don’t like me and won’t hang out with me because I am a jerk and my race has nothing to do with it? Abso-freaking-lutely! And this brings me to why I wrote this article. I am tired of all the America-bashing I hear constantly. Yes, she has done many wrong things in her past—which nation hasn’t?—but she has been quick to fix it. NO, she is not perfect, but, as one who was raised under a totalitarian system, I believe America is still the best nation on the face of the earth. Let’s stop looking at what she should have done right and start being grateful for how far this young country has come to correct her past.